Microraptor was always considered as the most beautiful feathered dinosaur and also one of the smallest dinosaur. It looked like the four-wing bird, which might be the ancestor of the modern bird. 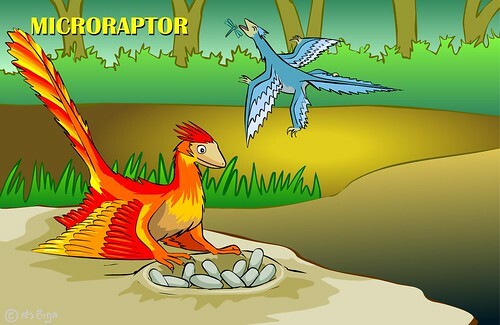 One of the most frequent questions is if Microraptor could fly. Some said, yes; and some said, no. Anyway, with that among of feather and the small body size, Microraptor should have been able to fly. Roll mouse over the small dinosaur, you will see how it eats the insect.